Progressive restaurants with a long term view for success in their business plan understand that their customers are there to not just eat, but to converse with family and friends. Restaurant soundproofing is a necessary step to control noise levels, so guests can be more comfortable. Without these controls in place, the acoustics are generally poor. Restaurants are built from hard reflective surfaces that make the space beautiful, and easy to keep clean, but render the room unfriendly due to the unwelcome echo levels. As the crowd swells, and the echoes climb, the noise becomes deafening as your clientele begin to strain to hold a conversation. Your repeat customers will start to dine elsewhere as a result. Improving restaurant acoustics and reducing noise are as important as the quality of your food or the level of your service. When you protect your guests, you protect your future. Hear from the Tavern Grill in St Paul, Minnesota on how well the NetWell sound panels performed. Why threaten your repeat clients with substandard acoustics when NetWell’s acoustic sound panels stand ready to resolve your acoustic issues? When it comes to restaurant acoustics and restaurant soundproofing, the goal is to improve the sound quality within your space by controlling your levels of unwanted ambient echo. If the echoes are allowed to carry in the room, background noise can build to uncomfortable levels as your guests strain to hold a conversation. By placing a series of ambient noise reduction panels into your space, the sound wave reflections will be captured and converted back out of the room, restoring the restaurant to premium sound quality. The key to successful restaurant acoustics is product selection, panel thickness and coverage. If you under treat the room, your values will be lost. That’s where our 25 years of acoustical experience can be of great service to you. The Room Analysis button at the top or bottom of this page is your first step. Use this to submit back the dimensions of your restaurant, and in turn, we will quote your panel count and cost. Once the project is defined, approved, shipped and installed, you will notice an immediate drop in your level of background noise. As a result of your soundproofing treatment, your restaurant will sound better. It is all about the art of controlling your echo. The most popular sound panel option designed for soundproofing a Restaurant is our cloth wrapped acoustic Fabric Acoustic Panels. These are decorative sound panels that can wall or ceiling mount as you wish inside your restaurant space. The panels are class A fire rated, easy to self-install, portable, durable. By capturing the background noise in your noisy restaurant space, we can restore your venue to premium sound quality. Your guests and your staff will thank you. In addition to our standard Fabric Acoustic Panels, there are other restaurant soundproofing products. 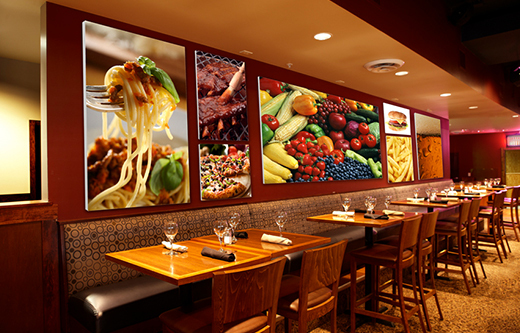 Often times, Restaurant owners will ask for a designer sound panel, called a PicturePanel, which can print graphics, logos, menu items, local area artistry, and digital images onto the face of your panels. 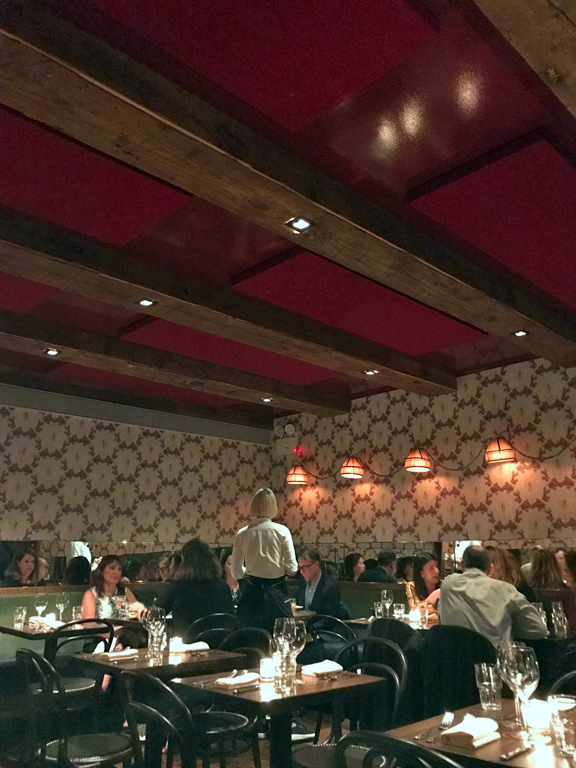 Acoustic Ceiling Clouds are also popular, which allow our clients to “float” their restaurant sound panels off the ceiling, rather than flush mount them to wall or ceiling surfaces. And if you have a black metal deck in your restaurant, the SelectSound Sound Barriers are black sound panels designed to disguise the placement into your ceiling. The Fabric Panel treatment has stood the test of time. For more than 25 years we have been placing this sound panel treatment into tens of thousands of spaces across America. 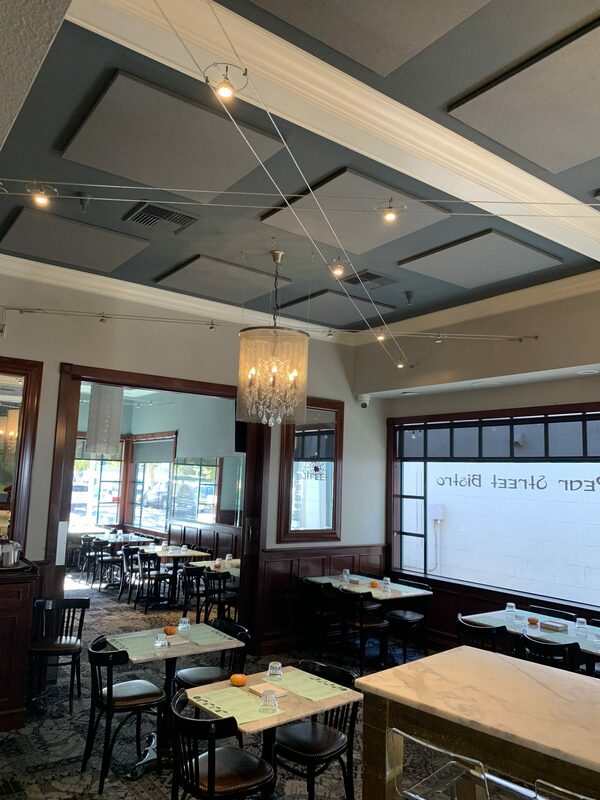 For restaurant soundproofing, these sound panels will combine to absorb your echoes, protect your space, and please both your staff and your clients. Fabric Acoustic Panels are available in 60 colors. By installing sound panels for restaurant noise reduction, you ultimately let your customers dine in peace. To view the variety of sound panel projects that NetWell prescribes, we invite you to visit our Case Studies Library. Here we showcase various recent sound panel projects to help give our new clients a better understand as to the visual presentation to their space and the testimonials that endorse our soundproofing treatments. All restaurants are designed with hard, reflective surfaces that are made of tin, granite, marble, steel, brick, concrete, glass, metal, wood or drywall. Not only are the surfaces designed to be attractive, but they’re also durable and easy to clean. The drawback is that these surfaces reflect and build sound, which can result in a loud restaurant and eventually force it to go out of business. Care must be given to lowering excessive noise levels. 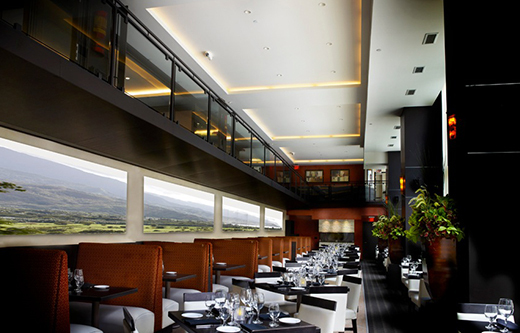 Use restaurant soundproofing panels to capture and convert the noise within your space. Noise that reflects off the perimeter surfaces in a restaurant spike exposure levels. As crowds gather during peak dining hours, people have to strain to be heard over the background noise. This produces excessive noise that creates an uncomfortable dining experience and drives customers away. Therefore, attention must be paid to properly soundproof a restaurant. 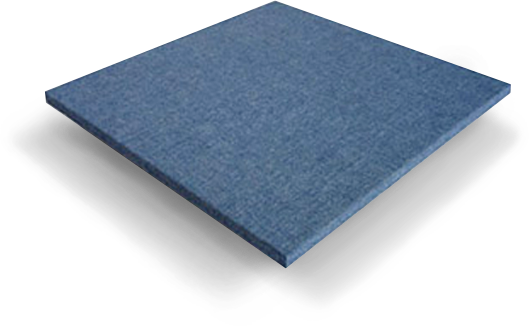 Most of the acoustic foam panels on the market are not class A fire rated and shouldn’t be used for soundproofing a restaurant. Even if the foam was class A fire rated (also known as melamine foam), it is still not a good idea because foam panels will flake over time and sprinkle dust particles into the ventilation system. These particles will eventually reach the food and tabletops within your restaurant. Sound panels that are placed beneath tables and chairs will not work to control the excessive noise within your restaurant. Sound panels need to be exposed to the room for premium sound quality. Mount the sound panels on your ceiling, so the panels can produce the noise reduction you’re seeking. Owners of loud restaurants agree that unwelcome noise levels drive customers away. The goal when soundproofing a restaurant is to lower the background noise to a minimum so customers can enjoy their dining experience. Dining out is a social experience. If the noise levels are untreated, repeat customers will dine elsewhere. Some owners prefer noise because it tends to get customers out the door sooner. Due to the excessive noise, owners can make more money by having more customer turnover and by pouring more drinks. Of course, most bar and restaurant owners put more stock into making their customers comfortable by using restaurant soundproofing products. By mounting your sound panels on the walls or ceiling, you’ll effectively capture the echoes that are disrupting customers. What remains will be lower levels of background noise and restored original sound. This results in less communication strain and a more comfortable dining experience for your customers. NetWell has been retrofitting restaurants with acoustic panels for more than 26 years. When deciding where to place your restaurant soundproofing, care must be given to the existing design. The goal is to not corrupt the design. Since every restaurant has its own look and feel, treatments will vary, but the bulk of our projects use our Fabric Panels. We offer 60 different color options to help disguise them in your space, and most often they are applied to the ceiling. In addition, we can upgrade the panels to be wrapped in graphics, photography, artwork, logos and more. These upgrades are more eye-catching and can be presented as murals too. We can also make your acoustic panels look like brick walls or your existing surface textures. How Many Sound Panels Does Your Restaurant Need, and Where Should You Put Them? Coverage amounts depend on the size of your public seating area. Once you submit your room’s dimensions to us, we will calculate your square footage and give you a quote for your sound panel project. You can call our help desk at 1-800-638-9355 with your dimensions or submit them on our Room Analysis worksheet. Cost control on your upcoming soundproofing project plays a key role in your decision making process. Our StartSmart series is built to help educate new clients on steps they can take to curb the expenses involved in a sound panel treatment. The course is free, easy to ready, and popular with our readers. Sign up today! Use this innovative tool to feed us the dimensions of your Restaurant, and we will define back the framework for your upcoming soundproofing treatment and quote your project. Questions? 1-800-638-9355. Submit the size of your dining space and we will calculate the correct amount of sound panel for your upcoming soundproofing treatment. And quote your project. Questions? Call to 1-800-638-9355.